Candle cutting: Alessandra Ambrosio's daring hair cutting technique revealed | HELLO! November 17, 2014 - 14:40 GMT hellomagazine.com HELLO! Fashion takes a look at Alessandra Ambrosio's daring hair cutting technique of candle cutting. Victoria's Secret angel Alessandra Ambrosio recently revealed that she owes her enviable hair to a daring ancient Brazilian technique. 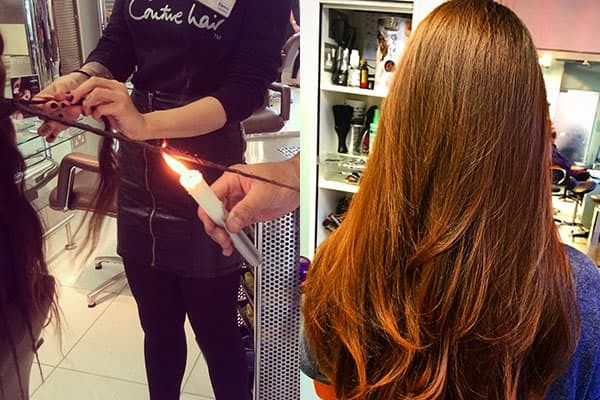 Candle cutting, or Velaterapia as it is also known, is the use of an open flame to sear split ends, revitalising your hair and leaving it healthier. The technique is popular with models such as Isabeli Fontana who have long hair, as it allows you to maintain your hair's length while keeping it healthy at the same time. It could be that Alessandra is working on getting her locks in top condition as she prepares to walk the Victoria's Secret Fashion Show in London in December. The show will be extra special for the Brazilian beauty, who has been chosen to wear one of this year's dazzling Fantasy Bras, alongside fellow angel Adriana Lima. "Words can't describe how excited I was when I received a call from Victoria's Secret to let me know that I would be wearing it," Alessandra told PEOPLE, having worn the Fantasy Bra before in 2012. The striking model has also been sharing photos on Instagram as she trains ahead of the runway extravaganza. Left: Candle cutting at the Richard Ward Hair & Metrospa. Right: The end result. DO NOT TRY THIS AT HOME – this is an in-salon service only, please seek professional advice before you try candle cutting. Taylor Swift confirmed to perform at Victoria's Secret show – again!